I am reposting this piece that I wrote in 2009. Please be in prayer for these precious women....different set of women this Thursday, 6/23/2011, but at the same facility. We will covet your prayers on their behalf! God has a special work to do in these ladies' lives! This is a very humbling post to write. I would like to open this post by giving you the words from Romans 3:23-24, which state, "for all have sinned and fall short of the glory of God, being justified freely by His grace through the redemption that is in Christ Jesus". I have been sitting here on the bed reading the word and praying that God would prepare my heart for what will hopefully and prayerfully be a very special day tomorrow. You see, tomorrow, I have been given the most humbling opportunity of serving a real English style, highly lady-like tea to a VERY special group of unlikely tea party attendants. I do not use the words "highly unlikely" as a derogatory statement about these very special women. In fact, I use it quite positively. I will be joining a group of other women tomorrow at 2:00 in the afternoon to hostess a group of about 60+ ladies at a local residential treatment program. By "treatment program", I mean exactly that. These ladies are being treated for drug abuse and alcohol abuse and are residents at a local facility especially for women (I am withholding the name of the facility in order to protect their privacy and anonymity) The ladies ministry at my church is heavily involved with ministering to these very special ladies. So, tomorrow, we will be serving them. As I said before, they are probably ladies who may not necessaily have ever attended a real tea party or even entertained the idea of attending such. But tomorrow, they are the highly honored guests-God's highly honored guests. These are ladies who may not have ever considered themselves "highly honored" by anyone. But the Lord sees them as highly honored and He has called us to treat them as he would treat them--as the royal guests of HIS table. Tomorrow, as we set the tables with our fine china and linens, clotted cream, lemon curd and all of the dainties that you would expect at a proper tea, please remember these EXTREMELY special ladies in your hearts and your prayers. Please pray that they will be sensitive and receptive to the word of God and that they will be receptive to those of us who are serving them. We are not going to this tea for ourselves, but for them. We are there to love on them and show them that they are just as equally deserving of being treated like a true lady, just as any of us are. We are there to show them God's perfect love. I'm sure that many of these women have experienced many rock bottom times in their lives, maybe even as recent as the last few weeks. They are not necessarily from any really different places from which some of us came. God still shows grace and mercy and He still meets people where they are. I pray that they will be overwhelmed tomorrow, not with those of us who serve but that they will be overwhelmed with the love of God. I thank you in advance for your prayers for them. I know that you may not know their names, but I assure you, God knows them one by one. 36 One of the Pharisees asked Jesus to have dinner with him, so Jesus went to his home and sat down to eat. 37 When a certain immoral woman from that city heard he was eating there, she brought a beautiful alabaster jar filled with expensive perfume. 38 Then she knelt behind him at his feet, weeping. Her tears fell on his feet, and she wiped them off with her hair. Then she kept kissing his feet and putting perfume on them. “Go ahead, Teacher,” Simon replied. “That’s right,” Jesus said. 44 Then he turned to the woman and said to Simon, “Look at this woman kneeling here. When I entered your home, you didn’t offer me water to wash the dust from my feet, but she has washed them with her tears and wiped them with her hair. 45 You didn’t greet me with a kiss, but from the time I first came in, she has not stopped kissing my feet. 46 You neglected the courtesy of olive oil to anoint my head, but she has anointed my feet with rare perfume. First, I would like to thank EVERYONE who was so faithful to pray for our special tea party this past Thursday. Monica....thank you for putting out the word on The Homespun Heart. Another huge thanks to Alicia Williamson Garcia for ministering to us through music but also through delivering that very timely word from the Lord. You challenged not only our very special guests, but me as well--I'm sure that the other hostesses would agree. WOW--where do I start? I guess I'll start with the actual tea itself. 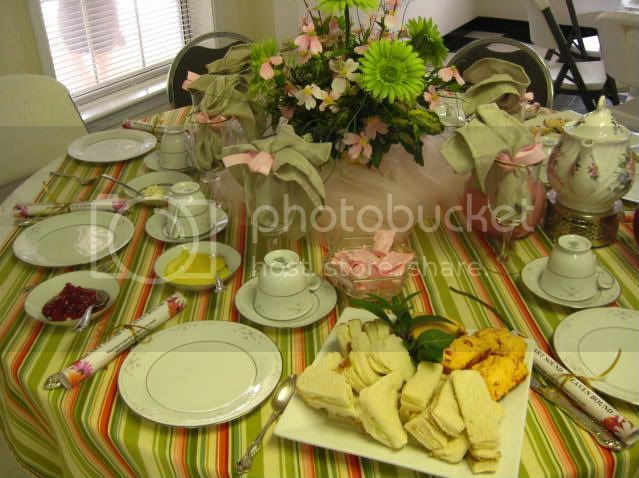 Here is a picture of my table after being decorated and then with the "tea goodies" decorating the table. 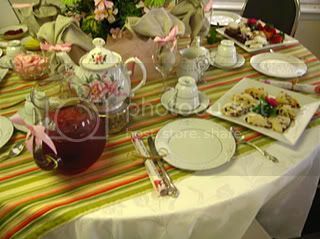 This is the table that I hostessed, right before I filled the serving plates with the "dainties" for our tea. Here you can see the delicious cranberry scones to the right, with the sweets in the backgroud. 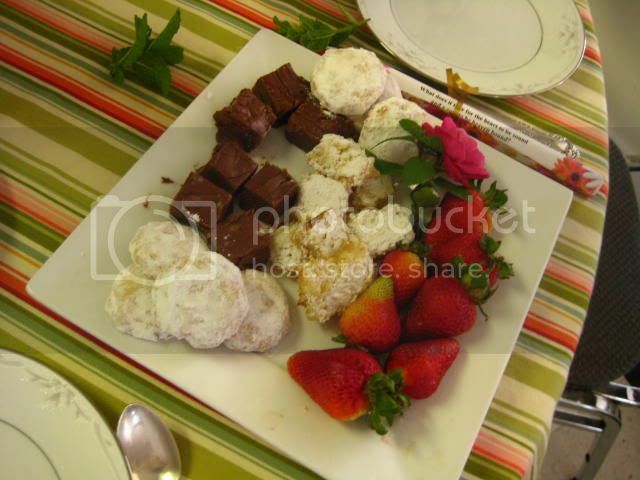 Our sweets tray contained beautiful little lemon squares, homemade creamy fudge, Danish wedding cookies and big, read and juicy strawberries. Along with the hot black tea that was served, we also offered an iced strawberri kiwi tea that was SO delicious and refreshing, because down here in the deep south, it gets "WA-WUM", as any good southern belle would say (that's "warm" for all of the Naw-thuhn-uhs reading this post). And what proper tea is complete without finger sandwiches? Of course there were cucumber sandwiches, chicken salad and some yummy little open faced homemade pimiento sandwiches. God was there with us on Thursday. He was glorified in every word and every action that took place. The women at my table were precious, to say the very least. I will treasure the handwritten prayer requests that they gave to me at the tea. I had the very high privilege of praying individually with each one over each of these humble requests. These women may be in some extremely dire circumstances as of late, including drug addiction, alcoholism, abuses of every sort and other issues to many to name. But on Thursday, they dined with us. They were ladies with us. They sipped hot tea, enjoyed scones with lemon curd, double Devonshire clotted cream and fresh strawberry jam. Some took their tea with cream and sugar, and some took their tea without. They laughed, they smiled, they heard a wonderful word from the Lord, and just for a minute, they were able to go to another place in time. It was a safe place, without ridicule and without judgement. It was a place that they were allowed to be the true ladies that they are, underneath what seems to others to be "tough exteriors". They wore the best clothes that they had...and they were our HIGHLY HONORED GUESTS for the afternoon. I can think of no place that I would have rather been at two o'clock in the afternoon on Thursday. Thank you again for your prayers. The Lord heard them, each one. And glory be to the Lord, at the close of Thursday, there were three more added to the Lamb's book of life (as reported to me from the sweet, precious owner of the facility). Finally, the Update from Ladies Night Out! Well, slowly but surely, I'm getting caught back up on my blogging. Recently, I posted about Ladies Night Out at my church, where I hostessed a table of eight ladies. WOW, what a night! We had the greatest time of worship, fellowship and sharing a meal together while getting to meet a precious sister in the Lord, Kasey Lowery Ewing. If you would like to see more of Kasey's incredible journey, you can visit her blog, High Heels in High Places. I would tell you her incredible story, but she tells it much better than I ever could. Kasey and her sweet husband (who was a former intern at our church) had the most horrendous experience of losing a child in a very tragic way. But, God, in His infinite wisdom, has used their story to touch the lives of many. If you have a minute, visit Kasey's blog. I can promise that you will be blessed. 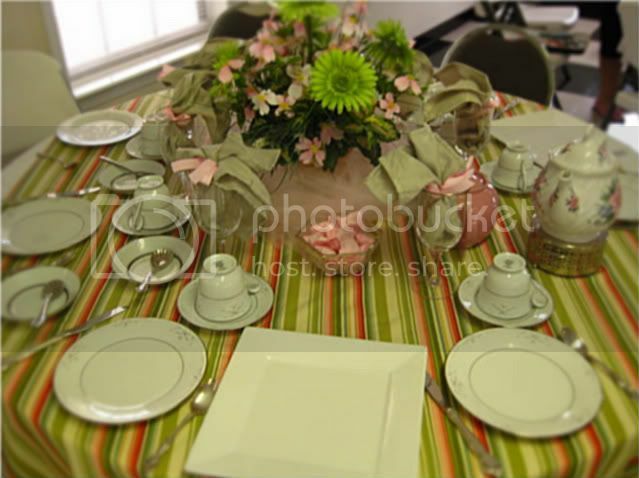 In the meantime, here are a couple of snapshots of the set and of my table. I LOVED our set! How girlie is that I ask you? It was a beautiful spring back drop for a very "springy" event! My Mom is in the picture below on the left and her neighbor and our friend, Robin, is on the right. Even though they attend different churches, they have become "regulars" at our Ladies Night Out functions. Our church is so very blessed to have such an incredible ladies ministry. I sincerely hope that others reading this post will either begin participating in your church's women's ministry or that you will help begin one if there is not already one in existence. Ours is such phenomenal. I think that for a long time I took it for granted, until I began to actively participating in the hostessing end of the ministry. I hope that you will get involved...if you do, please let me know your experiences. I would love to hear of other activities in other churches! Keep me posted! guarantee you that you will be blessed. I would give anything if all of my fellow bloggy sisters from around the globe could be here to share it with me! But, for now, here's a little sneak peek of the table that I'm hostessing. Mom went with me last evening to get it decorated for tonight...and it turned out so pretty and springy!!! These aren't the greatest pictures...I just snapped them on the trusty old Blackberry. I'll have "the good camera" tonight and will get some better snapshots of the happenings! Come back for a visit and a report on our great time of fellowship!